The question we wanted to see answered: Does AMP help local small and medium size websites get more traffic? Do AMP pages perform better in the SERP? Does AMP help local SEO? This was surprisingly easy. You can always count on someone to create a plugin to simplify the process. Using the Glue from Yoast and AMP plugins, we changed only the blog posts to be converted to AMP. The reason we did this was to not interfere too much with the user journey on our high-conversion pages. To be clear, AMP is not a ranking signal in itself. But… since it does improve page speed, it does play a factor. It also contributed to other factors that are ranking signals including mobile-friendliness, pogo-sticking, and time on page. So, although it doesn’t directly translate to a lift in your rankings, it does have a positive impact on your SEO. After three months of AMP running our test sites, we were able to answer our theories. Our theory was that we would see an increase in time on page and rankings, but bounce rate would remain consistent. There are several factors that contribute to a page’s improvement in the search results. The first factor is the rankings. The average rankings didn’t really change all that much, but click-throughs did see some positive movement. We also saw a substantial increase in the number of impressions, in some cases by nearly 300%. Of the total views across the three websites, 92% were new users, compared to the sitewide ratio of only 68% of mobile visitors being first-timers. AMP appears to have a positive effect on the Time on Site metric, which is a strong indicator that more people are reading the articles in their entirety. If you look at other retention metrics – pages per visit, bounce rate, goal conversions – then it isn’t effective in keeping people on the site. In our samples, bounce rates increased and conversions remained consistent with the non-AMP version. In the example below, we can see a significant drop-off in engagement for AMP pages compared to all other pages on mobile. For our experiment, we looked at the top blog posts for three sites in three very different industries. 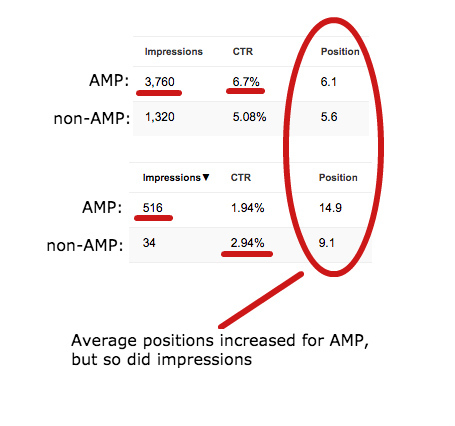 We compared the Google search impressions, rankings, and click-through rates to see if the AMP versions performed better or worse than their non-AMP counterpart in a comparative time period. We then also looked at the on-page metrics – time on page, pages per session, and bounce rate to see what the engagement levels were like. Overall, there was no correlation between the AMP pages improving the rankings for local type search terms. The blog articles marked up with AMP did see some considerable improvements in the visibility and engagement in the search listings. We also saw improvements in the time readers spent on the page. Ultimately, AMP didn’t provide any clear lift to our local search rankings or the overall business goals. Making the choice to use AMP on your site will come down to whether you use blogging to build your brand or to nurture leads. If it’s the latter, then AMP might not be the right choice. But if readership and building your authority in your space are the goal, then you should jump on the AMP wave. Need help implementing AMP in your SEO strategy or business or simply want to know more? Drop us a line, we’re more than happy to chat!